White Rainbow is pleased to announce a series of collaborative performances between Satoru Aoyama and Japanese musician Ken Ikeda to coincide with Satoru Aoyama | Division of Labour. 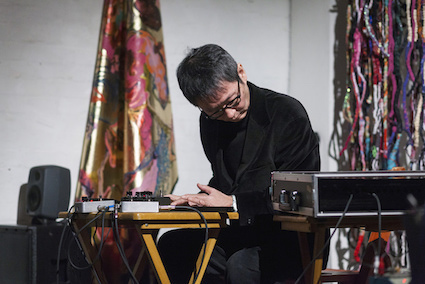 Ken Ikeda will perform a series of improvised musical pieces alongside a live video performance by Satoru Aoyama, featuring the artist’s embroidered maps, currently on display at the gallery. Ken Ikeda is a composer born in Tokyo (1964) – currently living in New York. He has exhibited sound art and visual installations around the world. He often collaborates with artists, such as the painter Tadanoori Yokoo and artists Mariko Mori and Hiroshi Sugimoto. He has also composed and recorded for the filmmaker David Lynch.